I think by now you will all know that my main interests lie with anything to do with archaeology and ancient times, mainly pottery Therefor it will come as no surprise that I also like collecting certain antique items, one of which are the beautiful Yixing teapots, of which I only ever managed to obtain two to add to my collection of teapots. 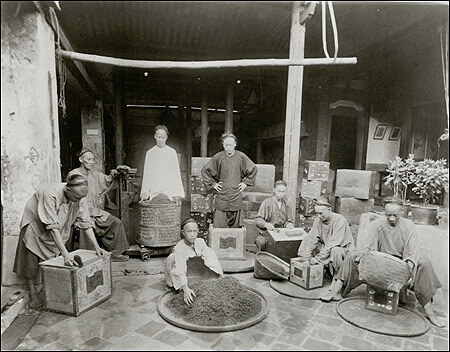 Archaeology reveals that as early as the Song Dynasty (l0th century) potters near Yixing were using local ” Zisha” (purple sand/clay) to make utensils that may have functioned as teapots. 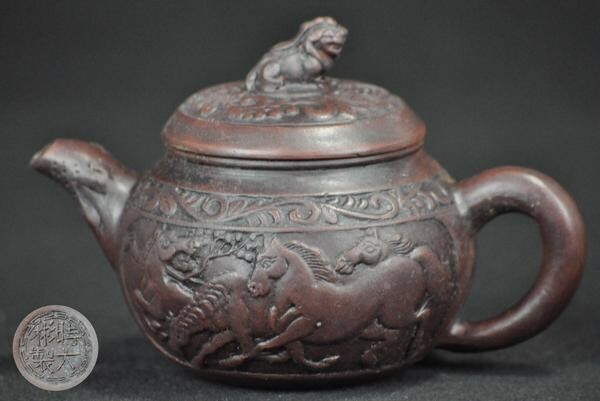 According to the ‘ Ming dynasty ‘ Zhou Gaoqi , during the reign of Zhengde Emperor, a monk from Jinsha Temple (Golden Sand Temple) in Yixing handcrafted a fine quality teapot from local clay, such teapots soon became popular and the fame of Yixing teapots quickly spread. 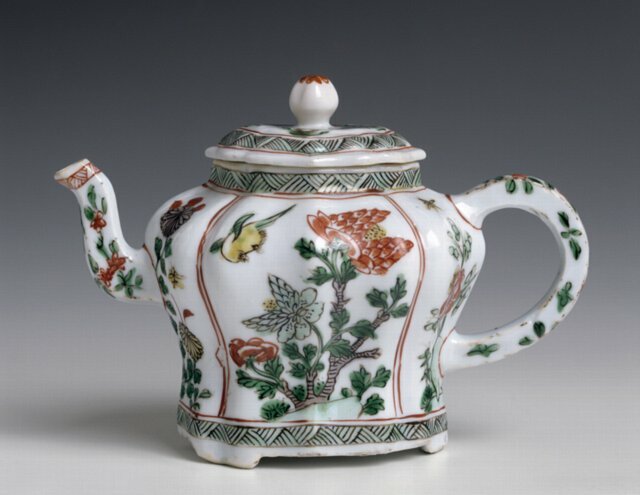 Teapots from the Ming dynasty tend to be very simple and elegant whereas the Qing dynasty (l644-19ll ) brought a higher level of decoration of the Yixing teapots. and the artists began to create pots with painting, inlaid with gold and silver. KangXi an early Emperor in the dynasty liked colored enamel pots which were more formal than those of today. All the pots that entered the palace could only have the seal of the Emperors reign and not the artists shop. 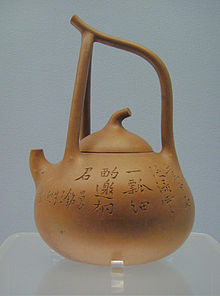 During his reign China began exporting these beautiful purple teapots to Europe along with the Chinese tea. 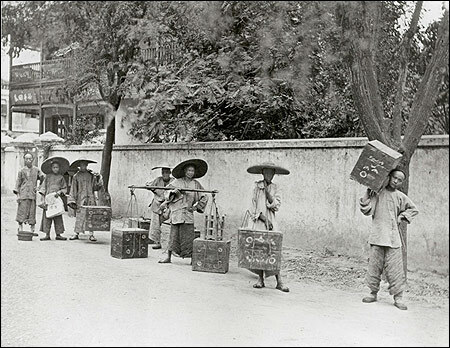 Porters lugging tea chests on carrying poles to the shipper 19th century. 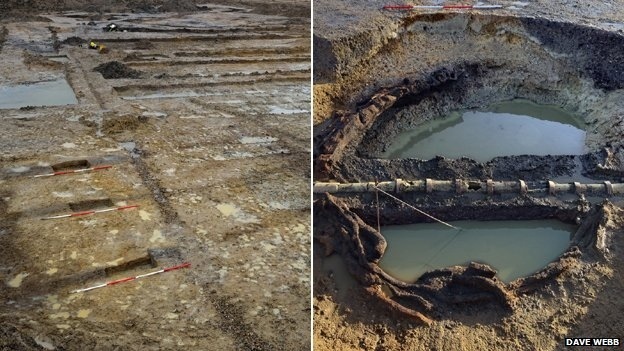 Excavations at a Cambridge University development have revealed what archaeologists believe is Britain’s oldest-known Roman irrigation system. Chris Evans from the university’s archaeological unit said they dated from between 70 AD and 120 AD. It was an “unparalleled discovery” and “effectively the first irrigation system we’ve seen”, he said. 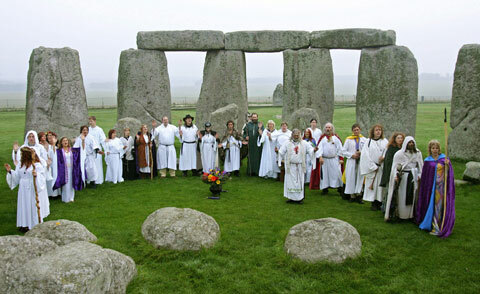 The source of the search for the Stonehenge blue Stones has progressed yet another step, with the announcement of a second confirmed quarry site in southwest Wales. 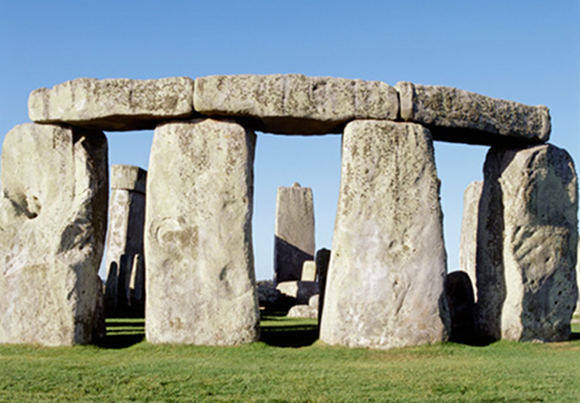 While the monuments sarsens are thought to have been sourced locally from the Marlborough Downs area, about 30km north of Stonehenge it has long been suspected that the smaller bluestones came from further afield with Pembrokeshire posited as a likely source since 1923. 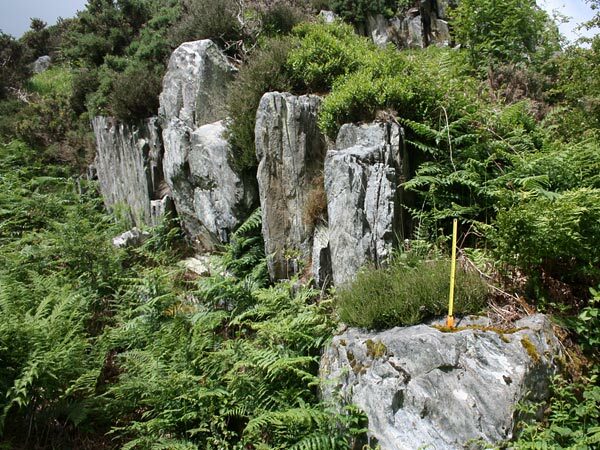 In 20ll Dr Rob Ixer ( UCL) and Dr Richard Bevins (National Museum Wales) identified the first quarry, revealing that the rhyolite bluestones came from a specific outcrop at Craig Rhos y Felin. Bluestone outcrop Craig Rhos -y- Felin. Photo courtesy National Museum of Wales. Now Bevins and Ixer, together with Prof, Nick Pearce of Aberystwyth University have located the source of another major type of bluestone- the spotted dolerites- at Carn Goedog in the Preseli Hills. The team used geochemical analysis to re-examine samples taken from upstanding bluestones and debit age drawing on data published by Richard Thorpe at the Open University in l99l. Cairn Geodog Presili Hills. Another major type of bluestone known as spotted dolerites. 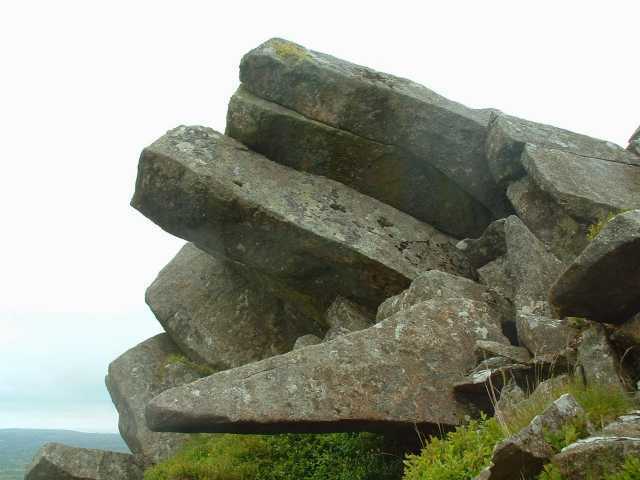 The Open University study looked at what are called ” incompatible elements ” in the rock, which allow you to distinguish samples from different regions, but all these data could prove was that the bluestones were from the Preseli area, ‘said Rob Ixer. However, we decided to look at the ‘compatable elements’ – these tell you about local changes to the molten material as it crystalises at high levels in the crust. Petrochemical analysis showed that all the crags in Presili come from the same batch of magma, but they have recognizable chemical differences, which is very useful. it means you can discriminate between specific outcrops. These findings which will be published in the Journal of Archaeological Science, could suggest a change of direction in the hunt for the source of the bluestones: traditionally such research has focused on another Preseli outcrop a mile away called Carn Meini. ‘Carn Goedog is a prominent outcrop about l5 m thick and covering some 30 m left to right’, said Richard Bevins ‘ Our next plan is to take samples and create a really detailed geochemical profile for the site-we hope eventually to establish the source of all the ‘Stonehenge bluestones’. It is a search that is likely to continue for some time, Rob Ixer added. 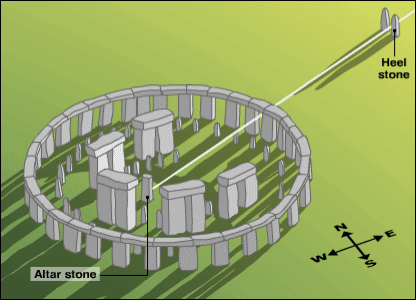 It is believed there are at least ten kinds of bluestones at Stonehenge and most likely from ten separate localities, there is still a long way to go before completion of the second quarry site.